A mature and gorgeous stop-motion–animated film about feudal Japan and a family’s mythical legacy? Summer movies should always be this smart. For impeccably crafted tearjerkers, leave yourself in the capable hands of Pixar. For something a few notches darker—like this dazzling Edo-period–set animated movie concerning a Japanese fable of devotion and bravery—the wildly inventive stop-motion group Laika has you covered. Its visual stunner Kubo and the Two Strings—directed by Travis Knight, the lead animator of Laika’s The Boxtrolls and ParaNorman—follows our hero Kubo (Art Parkinson), a resourceful, one-eyed 12-year-old with unrefined powers he inherited from his mother, a god. Carrying the mantle of his deceased samurai father, Kubo draws on his exceptional storytelling gifts, aided by an abundance of colorful origami figures that magically materialize and gracefully fold themselves into his tales. He also scrapes together funds from townspeople to care for his loving, somberly depressed mom, a lonely widow. Still furious about her marriage to a mere mortal (over though it is), Kubo’s relatives vow vengeance. There are his creepy, immortal twin aunts (Rooney Mara), whose every appearance rivals the unsettling sisters from The Shining, as well as a malicious maternal grandfather (Ralph Fiennes). They decide to track down our young hero to steal his remaining eye and make him “as blind to humanity as they are.” But joined by a quick-witted, protective monkey (Charlize Theron) and a friendly warrior cursed with an erased memory (Matthew McConaughey), Kubo embarks on a journey to retrieve a suit of armor that could save him. 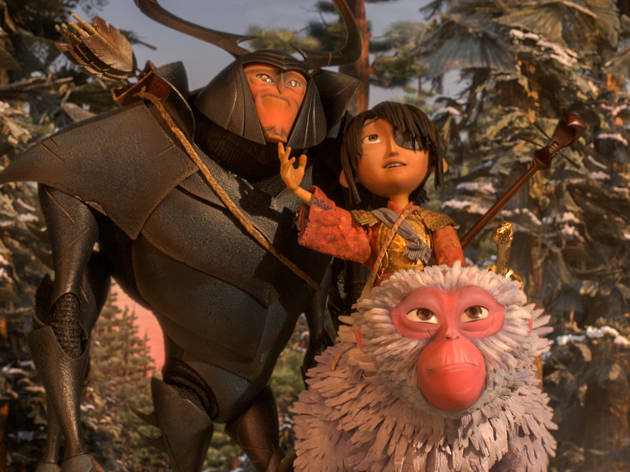 Despite the occasionally labored writing (with attempts at humor that are dry and distancing), Kubo and the Two Strings is swoonworthy in its vibrant visuals that span across unruly seas, lush landscapes and vivid seasonal colors. The film doesn’t quite cut loose to hit emotional high notes, but Regina Spektor’s velvety cover of “While My Guitar Gently Weeps” poignantly completes a sweet, generous film. Two years ago, stop motion animation geniuses Laika were responsible for one of my favourite films of 2014. ‘Boxtrolls’ was sharp, grotesque and hilarious with a whip smart script and characters that you couldn’t take your eyes off. 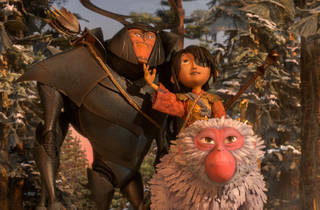 This year, in ‘Kubo and the Two Strings’, director Travis Knight and his epically dedicated team have crafted a film that is astonishingly breath-taking to look at, even if it doesn’t quite measure up to those cheese loving ‘trolls script wise. This is the story of Kubo, a canny 12 year old with a pirate-esque patch, a shock of 90’s boy-band hair and a magical skillset to rival Harry Potter, and the journey he undertakes to discover what happened to his human father. Along the way he is helped & protected by Beetle and Monkey as he battles against his widowed mother’s relatives who, furious at her marriage to a mortal, want to pluck out Kubo’s remaining eye and render him as blind to the human race as they are to them. The visuals here are stunning. Incredibly vivid and with immaculate attention to detail, each scene appears on screen in front of you in a sweep of sea-dwelling or land-faring majesty. The world that has been created for Kubo to live in is relatable, eye-widening, comic and terrifying by turn with Charlize Theron’s Monkey a marvel of animated detail and Matthew McConnaughey’s Beetle the most courageously endearing of sidekicks. Top notch creepy points go to Rooney Mara’s witchlike twin aunts while giant skeletons and bulbous underwater eyes will have you silently applauding the imagination and talent of the Laika team. If you're wondering how young is too young to watch this, let me just say that there were fairly young children (under 10 years old) in our screening who seemed less bothered by the realistic and eerie on screen happenings than I was! At just over 100 minutes long, there are patches in the first half where the momentum slows a little too much for my liking and the script isn’t always as smooth as it could have been but it feels churlish to pick holes in something that is quite simply splendid to watch and streets ahead of even the closest competitors. Regina Spektor’s beautiful cover of ‘While My Guitar Gently Weeps’ is a glorious song to end with – and a real earworm as my constant playing of it later at home is testament to – and make sure you stay for the end credits which are manna from heaven for film geeks. These are the kind of films that need our support and our patronage – there’s nothing wrong with Pixar and Disney and Illumination but look up the words ‘labour of love’ and you’ll find stop motion animation so make sure you find this and watch it while you have the chance. Kubo has become one of my favorite animated films - if not just one of my favorite films of all-time. Aside from the stunning animation, the story has a lot of heart and will make you laugh and cry - it's definitely not just for kids. There are some genuinely scary moments, but if you appreciate a well-told, classic adventure epic - this is a must-see film for you.